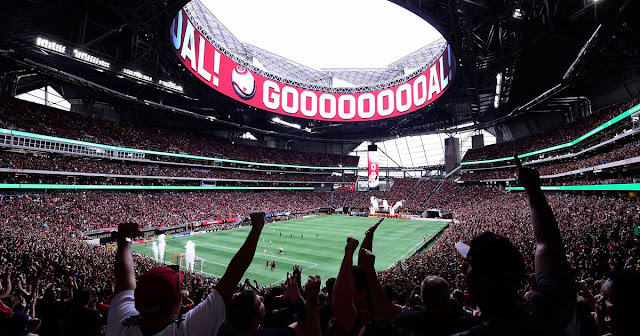 New York Times – "A New Atlanta, United by Soccer"
"As in much of the American South, the sports landscape in Atlanta is dominated by football, both professional and college. But for transplants like Riddle without a tie to an existing franchise or university, true sports love can be hard to find. The Braves’ long run of success in Major League Baseball in the 1990s and early 2000s is now a memory, and last year the team moved to the suburbs. The Hawks of the N.B.A. have rarely drawn well, and two N.H.L. hockey teams have come and gone. Last year, Atlanta United eagerly stepped into that pro sports void, smashing attendance records, dominating M.L.S. merchandise sales and leading the league in scoring. Six months after it first kicked a ball, it became only the fourth team in league history to qualify for the playoffs in its inaugural season. This year, its upward trajectory has continued unabated: Attendance has continued to grow, to about 50,000 fans a game, and the team is again competing for the league’s best record." But in the last five years, he said, he has sensed a growing pride in the city, especially among its younger residents. “This generation of people,” Tavani said, “want to create a special place.”"
"For years, M.L.S. clubs had looked to Europe for marketable names for the top end of their rosters, and their payrolls. But when Eales joined Atlanta United in November 2014, he suggested something different to Blank: He wanted to focus on signing talented, lesser-known players in their 20s, mostly from South America, with an eye on developing them for a few years and then selling them to bigger, richer clubs in Europe. The strategy is the financial survival plan of the vast majority of the world’s clubs, but in M.L.S. — which had long preferred to spend its limited acquisition funds on more established, more well-known names — it qualified as revolutionary. Eales persuaded Blank, who would need to ante up millions of dollars to fulfill the vision, to see the moves not just as acquisitions, but as investments. “With older players, there’s no upside because they are at the ends of their careers,” Eales said. “They’re 34, and maybe have two years left,” and have little resale value. Signing a younger player to a multiyear contract, he argued, offered the potential that even the biggest purchases might pay for themselves one day. “You might get $20 million or $30 million,” Eales said. “And at the least, you might be able to get back what you paid the player.”"